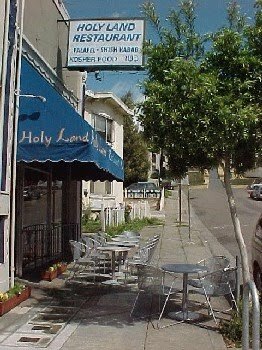 Holy Land Restaurant 677 Rand St./Lakeshore Ave., (510) 272-0535. L-D Sun-Thur, F to sunset; $. No reservations. Located on a quiet side street, this simple spot has a few tables inside and, in good weather, more outside on the sidewalk in front. It has been called a “holey” in the wall, and it is strictly counter service, but the fresh Middle Eastern fare is served up fast. Among the many delicious choices are matzo soup, malawach fried Yemeni flat bread, a combo plate of delicious freshly-fried falafel with hummus and Israeli salad, a combo salad plate also with hummus, and a blended fresh-mint lemonade. A portion of spicy green zhug sauce comes with most items, and sometimes a special such as spectacular fresh-corn fritters is an option. The restaurant is glatt kosher and supervised by a rabbi.